I love Tarte Tatin, and have previously written a blog about Tarte Tatin making that with Julia Child’s caramelized apples, and Emeril’s pastry crust. This year, because my wife is eating gluten free, I thought, why not make this into a cake, but with the caramelized apples that would typically top a Tarte Tatin. It worked! 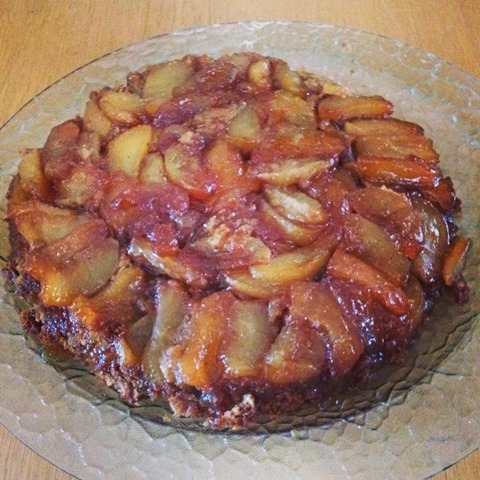 My guests had 4 desserts before them, and most said the apple cake was the best, gluten or not. The caramelized apples are the way Julia Child would make them for Tarte Tatin. This year I used Honey Crisp Apples, but you can use Golden Delicious, or whatever you would normally choose for a pie or any cooked apple dessert. Peel, core, slice apples and toss in juice of 1 lemon. Then sprinkle on 1 cup sugar. Set aside in bowl. Melt butter in 12” cast iron pan on medium-high heat, then add remaining 1 cup sugar and WATCH IT, stirring almost constantly, until sugar caramelizes. Don’t let it burn. You are looking for a velvety smooth medium brown texture. When it reaches this state, take it off the heat. Drain the apples in a colander, then arrange the apple slices in a pattern in the caramel. Be careful, the pan stays very hot. I use a pinwheel design, starting at the outer edge, then creating 2 rows. Pile any extra apple slices on top, and make it level. Put pan back on low heat and let apples simmer in the caramel about 10 minutes. Press down lightly on apples to ensure that all get some caramel on them. Meanwhile make the cake. Preheat oven to 350. Sift together dry ingredients: GF flour, almond flour, baking powder, baking soda, salt. Soften the butter. Cream butter and sugars with mixer until smooth. Add eggs, one at a time, with mixer on. Add oil. Add vanilla. Alternate adding flour mixture and cream, scraping down bowl regularly, and finishing with flour. After the apples have cooked in the caramel about 10 minutes, take them off the heat, and sprinkle lemon zest over apples. Sprinkle 1 tsp cinnamon over apples. Put batter over apples. It will barely cover, so deposit it all around, then very gently smooth over with spatula. Bake at 350 for 45-50 minutes, until cake tester comes out almost dry (this is a moist cake, and it is also absorbing liquids from the apples). When done, place pan on cooling rack (ideally in front of a window) for 5-6 minutes. Run a knife around outside edge. Invert cake plate over pan and hold firmly, turning the pan upside down. Tap if needed for cake to land on plate. If some of your apples stayed in pan, don’t worry, just use a fork to gently lift them out and replace them in the pattern on what is now the top of the cake. Let cool at room temperature until ready to serve. Can be refrigerated or frozen. 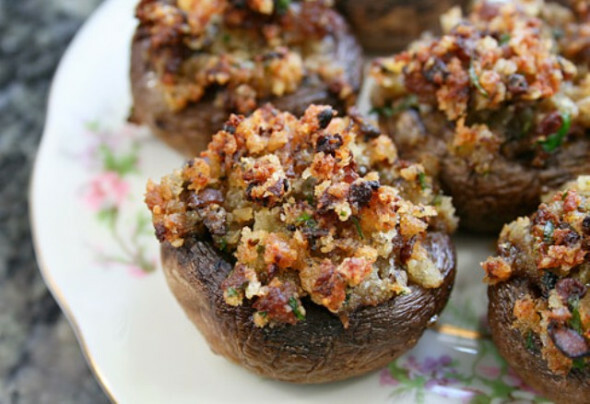 THIS IS A NEW, EVEN EASIER VERSION OF MY CLASSIC STUFFING STUFFED MUSHROOMS. We do “Gourmet Leftover Day Dinner” a few days after Thanksgiving, and I enjoy preparing these more unusual foods even more than T-Day itself. This first one requires that you’ve made a nice and greasy cornbread sausage stuffing. The rest is easy! On Thanksgiving, we use a recipe from Better Homes and Gardens for Sausage Cornbread Stuffing. As an appetizer, 3 per person. I served alongside a green salad with orange vinaigrette. Clean mushroom with damp cloth. Trim out stems, gills, and if needed, widen the bottom opening with a paring knife, going around in a circle. Toss mushroom caps gently in 2 tbsp olive oil. Place upside down (curved side up) on cookie sheets and season with salt & pepper. Bake in oven for 10 minutes (watch for when they begin to turn brown) and remove and set aside. Dice the leftover stuffing to small bits, and put in large bowl. Mix in cheeses (reserve 3 tbsp parmesan for top). Mixture should be slightly crumbly, but hold together when compressed. If needed, add broth or a bit of olive oil (just a tablespoon or two) to achieve slightly moist consistency. Flip over the caps, and stuff generously with filling. Place filling side up on cookie sheets. Sprinkle a bit more parmesan cheese on top. Bake for 15-20 minutes until brown. Can be served warm or at room temperature. P.S. If you are curious what makes this recipe even easier than the original, see the original posting here. In the original, I cook the mushroom stems and add them into the stuffing mix. But I have found that just the stuffing and cheese is really good! 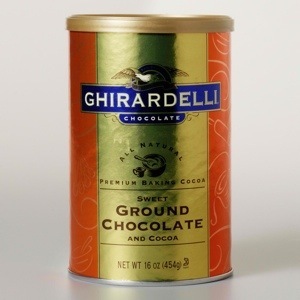 I love the taste of the brownies I make from Ghirardelli Ground Chocolate, so I figured that there must be a good cookie recipe using this product. But, after much searching, I didn’t find much that looked promising. So, I made one up. 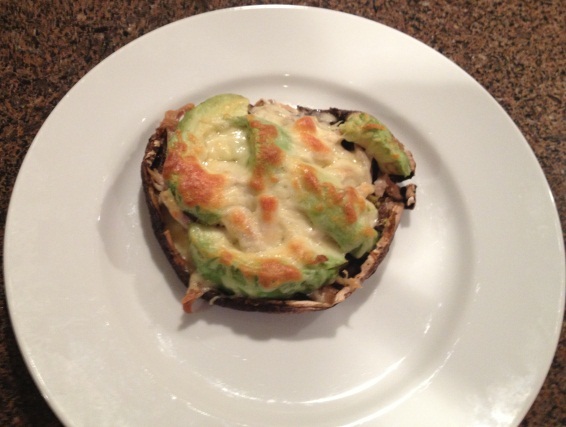 My goal was to have a really easy recipe I could make with my 4-year old granddaughter. Many chocolate cookie recipes require you to refrigerate the dough before forming the cookies. Not this one! Without a 4- year old assistant, you could probably make these in 10 minutes. Really easy! And good. Chewy, chocolatey, and they freeze well too. Using stand or hand mixer, cream butter and sugar until smooth, about 2 minutes. Add eggs and vanilla and mix again, 30 seconds. Sift together flour, ground chocolate, baking powder, baking soda, salt. While mixing wet ingredients, add dry ingredients gradually. The mixture may seem too dry and crumbly – don’t worry! By hand, mix in half the mini M&M’s. Turn over dough in bowl and knead very gently until mixture starts to come together in one mass. The butter will end up holding it all together. Use a small dough scoop to place dough on parchment lined cookie sheet, or pinch off tablespoon sized chunks, and roll gently and briefly to form smooth ball about 1 1/4” in diameter. Drop about 2” apart (they will spread during baking). I barely fit 15 on to 2 large cookie sheets. 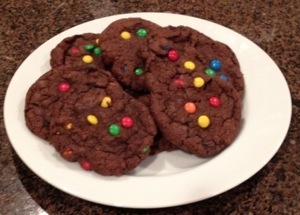 Place the other half of the M&Ms on top of the dough, and gently press them into the top of your cookie after forming the ball on the cookie sheet. Bake at 350 for 12 minutes. Don’t overbake or let them darken too much – they are better soft and chewy. Cool on cookie sheet on rack. I wanted to surprise Susi with something freshly baked this morning, and the bananas just called out. 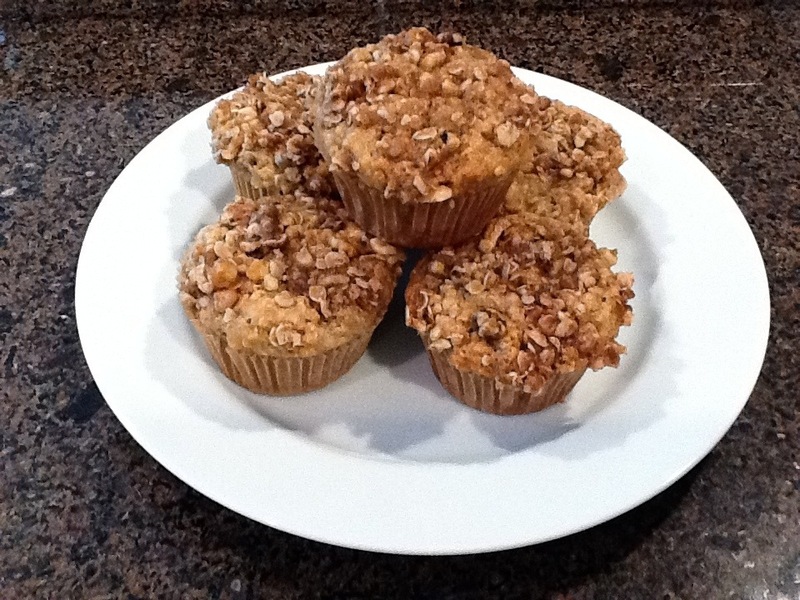 I challenged myself to make a healthier version of muffin, and the results were very good. This recipe made 18 muffins, only because I used round numbers for ingredients. To increase to 24 muffins, multiply each ingredient by approx. 1.33. The protein comes from milk, eggs, whey, oatmeal, and there is some protein in the flour and walnuts too. I’m not a nutrition analyst, but adding it up, I’d say there was 6-7 grams of protein in each muffin. This is relatively low fat and low sugar too. If you don’t want to use Splenda, add another 1/4 cup brown sugar. Preheat oven to 350. Line two muffin tins with 18 muffin papers. Sift together flour, baking powder, baking soda, salt, whey, cinnamon. In a separate bowl, whisk eggs, brown sugar, maple syrup, oil, vanilla, Splenda until silky, about 1 minute. Alternately add dry ingredients and milk, stirring with whisk, finishing with dry. Add mashed banana, then gently fold in oats and walnuts with spatula. Don’t over mix – you will limit the rise in the oven. Fill muffin cups to below the top (these rise well). 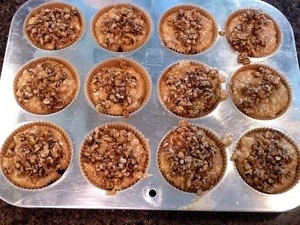 Mix together topping ingredients with a fork, and scrape into muffin cups, keeping the topping a bit loose. Baked on middle rack for 15-18 minutes, until an inserted tester just comes out dry. Cool on rack. Two days after Thanksgiving, we do “Gourmet Thanksgiving Leftover Dinner”, which is far more fun for me to cook than traditional Thanksgiving dinner. The last few years I’ve made Yam Swirl Cheesecake which the family loves, but we elected not to have yams this year. We did have store-bought pumpkin pie, and my son made pumpkin bread, and those called out to be repurposed, so I made Pumpkin Spice Trifle. Trifle should always have some kind of fruit or jam, so I made a quick cooked apple layer. This came together very well, and it is now gone! (Well some of it may be on our hips). Peel and dice the apples, and put in small deep saucepan with water, regular sugar, pinch of salt, spices, chopped apricots, and cook about 10 minutes until soft. Set aside to cool. Whip the heavy cream with confectioner’s sugar. Put half of the cubed bread on the bottom of a trifle bowl. [Option: You could drizzle some brandy or liqueur over the bread. I didn’t do that this time]. Put half of the cooked apple mixture over the bread. Carefully put in half of the pumpkin/whipped cream mix and smooth out from the middle to the edge with an offset spatula. You want a pretty edge on the outside! Put in one half of the remaining whipped cream, and smooth out to the edge. Repeat the layers, finishing with whipped cream. If you want to get fancy, feel free to pipe the top with a pastry bag and tip. I just swirled it with my offset spatula. Garnish with a few pieces of fruit – I used whole cranberries spooned out of our leftover cranberry sauce. Refrigerate for at least 2 hours, or overnight. If you are storing overnight, you may want to cover the top with plastic wrap, and re-swirl or pipe the top at the last minute. The protein can be beef, pork, chicken, shrimp or tofu. I typically marinate the protein in some of the sauces I will use for just a few minutes to several hours. Then, the protein is cooked lightning fast when your wok or saucepan is very hot, and put back in with the veggies and sauce. The veggies have to all be chopped and ready to go. Cook the ones that take a little longer first (like onion, carrot, broccoli), and the quicker-cooking ones last (mushrooms, cabbage). Make your sauce with the last cooked veggies, then dump everything back together, adjust flavor and thickness (with dissolved cornstarch), and you are done. 1 1/3 lb steak (I used skirt steak, but you can use any cut that works for you), sliced into ½”x ½” x 2” strips. Prepare all veggies and have ready for cooking. Marinate sliced beef in: 2 tbsp soy sauce, 1 tbsp corn starch, 1 clove garlic, crushed, 2 tbsp schezuan sauce. 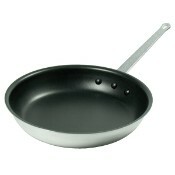 Heat wok or deep angle-side 12” saucepan (this is what I use – gets hotter than my wok!). Keep an 8 qt. stock pot nearby – you will use this at the end. You will now be cooking 4-5 batches of food, and dumping each pan full into a stainless steel bowl. 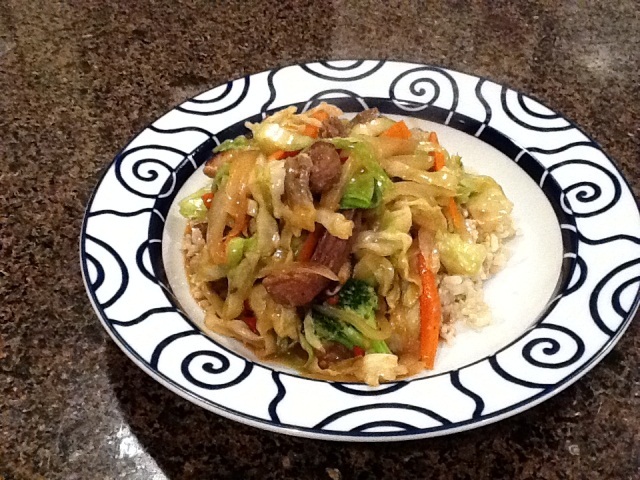 Add 1 tbsp of beef, and stir fry 2 minutes until just when red is gone from outside of meat. Don’t overcook! The meat will continue to cook while it sits, and will then fully cook when combined with veggies and sauce. 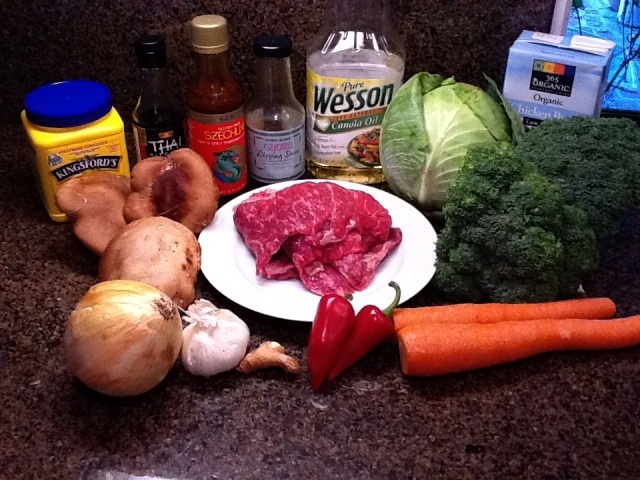 Cook beef in batches – don’t fill up the pan. Put cooked beef in large stainless steel bowl nearby. Keep pan hot, add 1 tbsp oil and stir fry onions & carrots, about 3-4 minutes. Add garlic, ginger and peppers for just the last minute. Do not burn the garlic! Turn into bowl with beef. Add more oil, and stir fry the broccoli, 3-4 minutes. More oil, stir fry the mushrooms. Now we make the sauce – the mushrooms will drink it up! 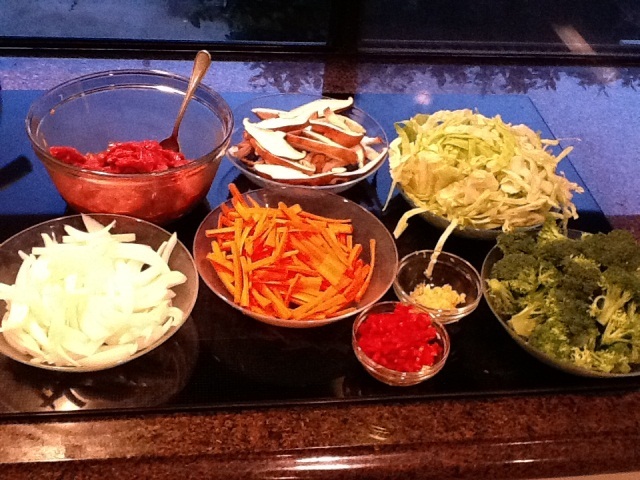 Add fish sauce, gyoza sauce, schezuan sauce, soy sauce (or any Asian flavor combo you like – about ¼-1/3 cup total). Add 1 cup broth/stock/wine. Bring to boil, add dissolved corn starch in batches until the sauce is the thickness you like. Add more broth or cornstarch to adjust. Put stockpot on stove and heat. To your saucepan with mushrooms and sauce, add cabbage, and stir until just wilted. Turn into bowl with beef. Take the whole bowl of food, and dump into heated stock pot. Raise heat to medium, stir together about 2-3 minutes until everything is hot. Adjust thickness of sauce if desired. Add ½ tsp cracked black pepper.